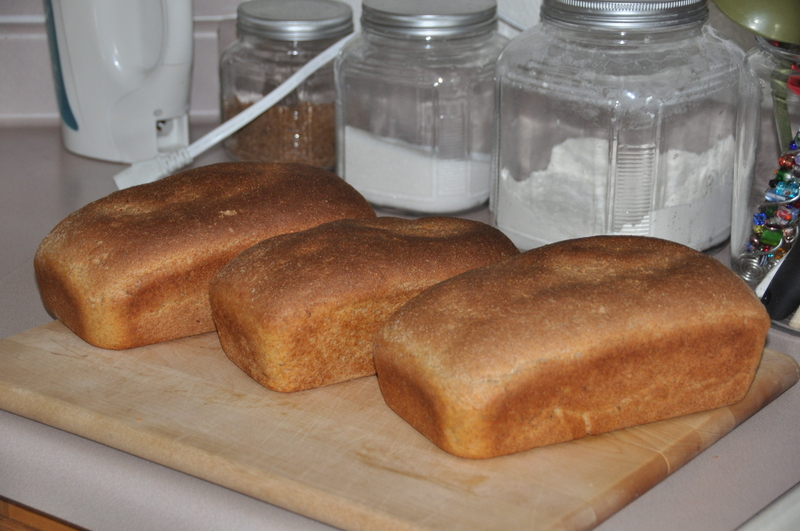 I put this recipe off until the end night because I couldn’t find any whole-wheat kernels locally. 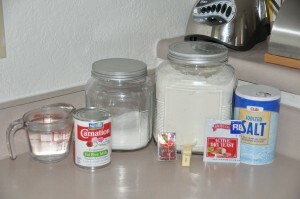 I ended up substituting cracked wheat instead, which I soaked in boiling water for one hour per the recipe. 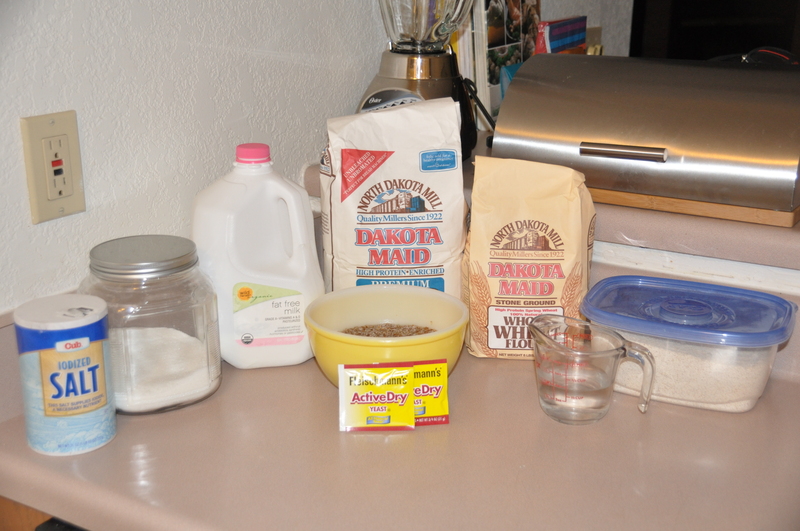 I mixed the dry ingredients together, and then I very carefully added the proofed yeast mixture, drained cracked wheat, water, and milk. 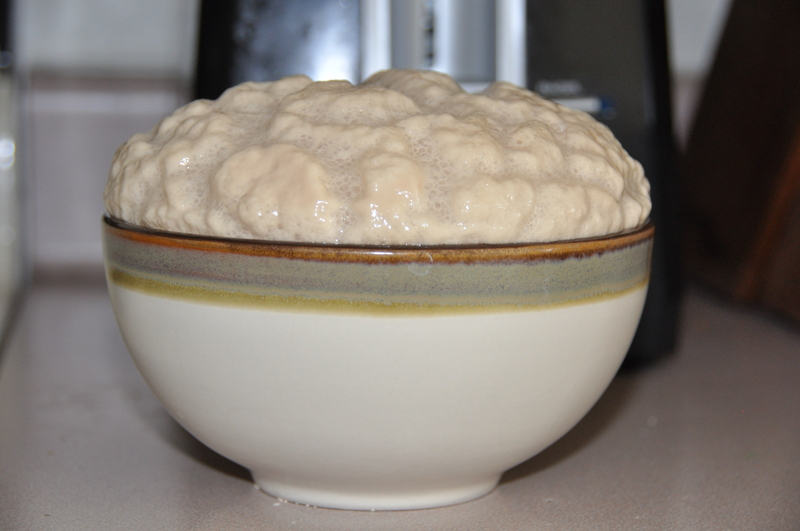 The dough was difficult to mix since my largest bowl was too small to comfortably accommodate nine cups of flour and various other ingredients, but I managed to make a decent dough. 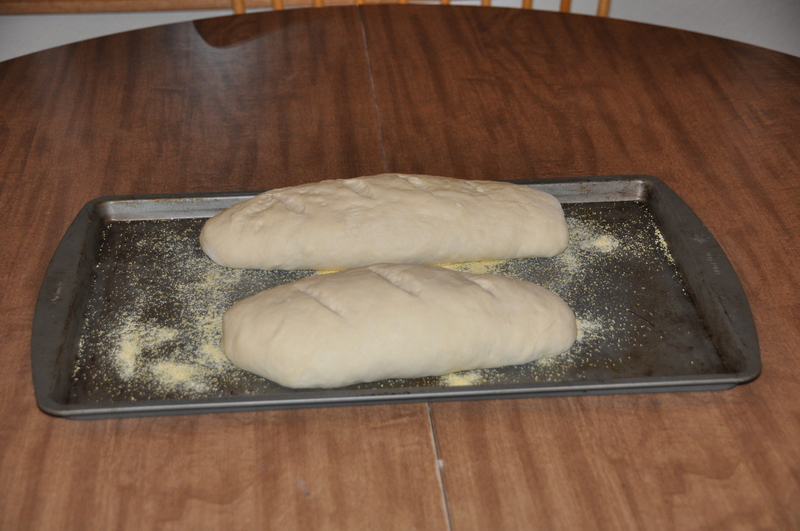 After a thorough kneading, I let it rise for an hour. 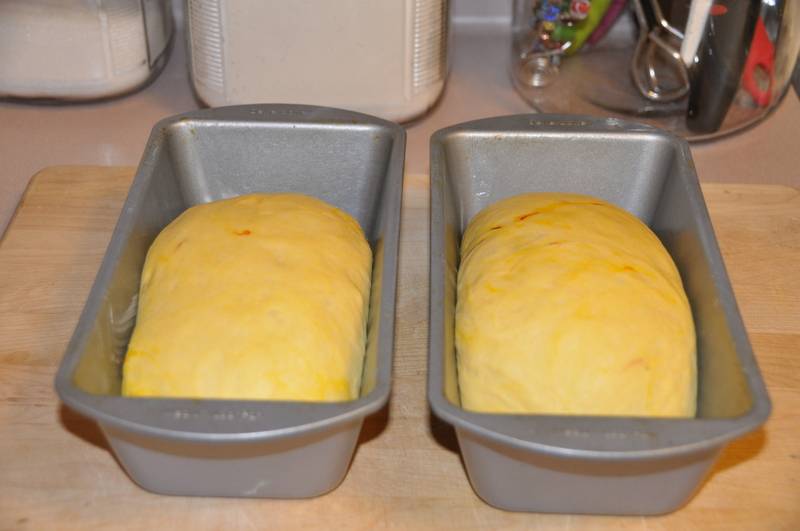 Next, I formed the dough into two loaves. 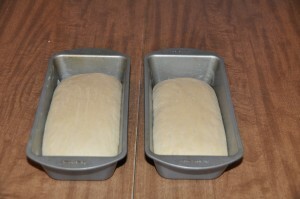 Since I didn’t have the 10 x 5 pans called for by the recipe, I shaped two long loaves and placed them in my 9 x 13 glass baking dish. 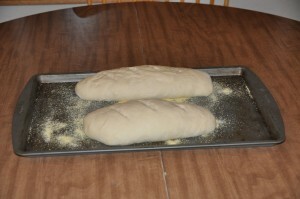 After about 45 minutes, they had doubled in size and were ready for baking. After one hour at 400 degrees, I had two delicious loaves with an incredible looking crust. Mrs. Elizabeth Ovenstad’s Bread tasted just as incredible as it looked. 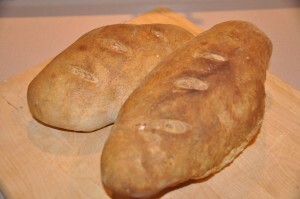 It has a light, even texture with a hearty flavor and an amazing crust. Even Mike, who isn’t a big fan of whole-grain breads, couldn’t get enough of this. 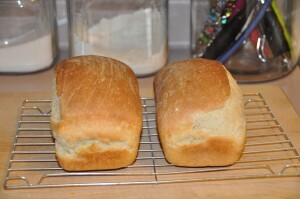 Luckily, the loaves are huge. Since I don’t have a large kitchen or a large bowl, and harbored some strong reservations, Pumpernickel Bread has been a recipe that I’ve put off until the bitter end. 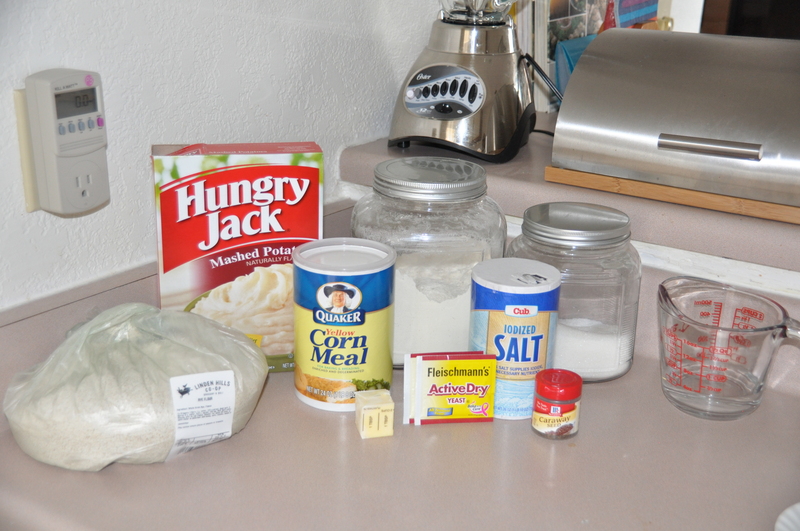 I used prepared instant mashed potatoes. 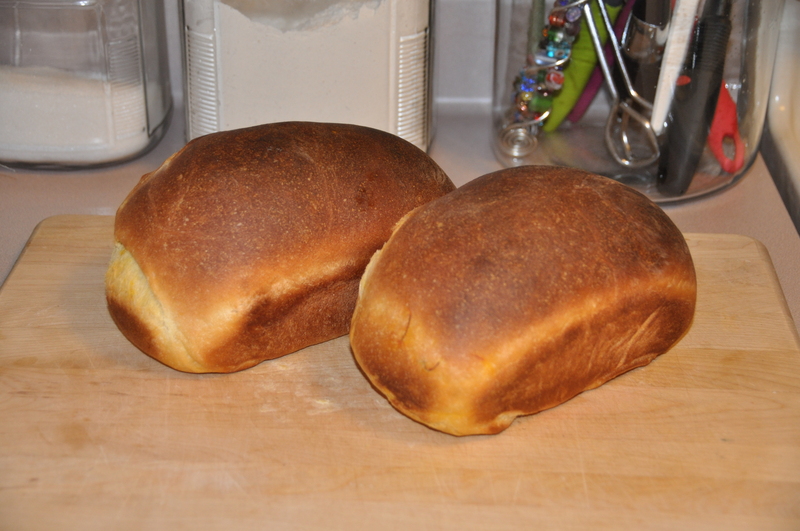 But I finally finished all of the beginning preparations, mixed in an ungodly amount of flour, and manhandled a huge mass of sticky dough into semi-submission. 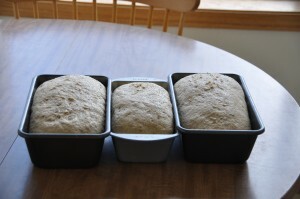 I let the dough rise until it had exploded out of my not-large-enough bowl, and then formed it into three loaves. This was difficult, because somehow my dough had reverted back to its sticky state while rising. I ended up with one 8 x 4 loaf and two 9 x 5 loaves. Once they had doubled in size, my loaves went into the oven at 425 degrees for 10 minutes and 350 degrees for 40 minutes. 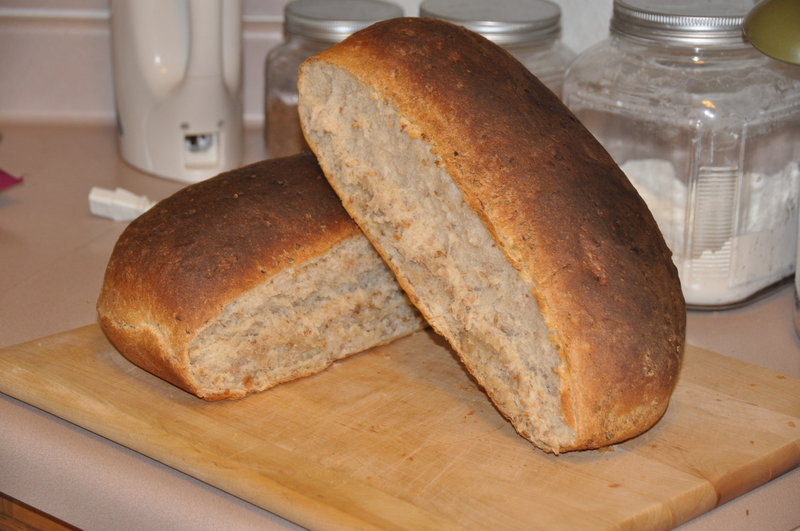 Pumpernickel Bread I is delicious–it is more of a rye bread than a pumpernickel, with only a hint of caraway. Best of all, it made some very tasty Reuben sandwiches with leftover corn beef from St. Patrick’s Day. 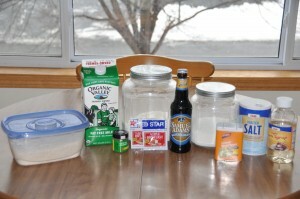 Despite my reservations and small kitchen, I was up to the challenge. 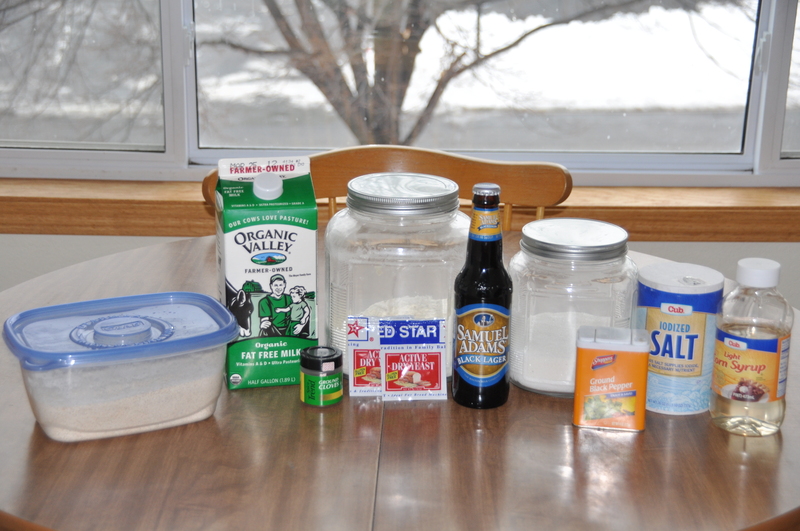 Over the course of this project, I researched James Beard and read many of his other books. 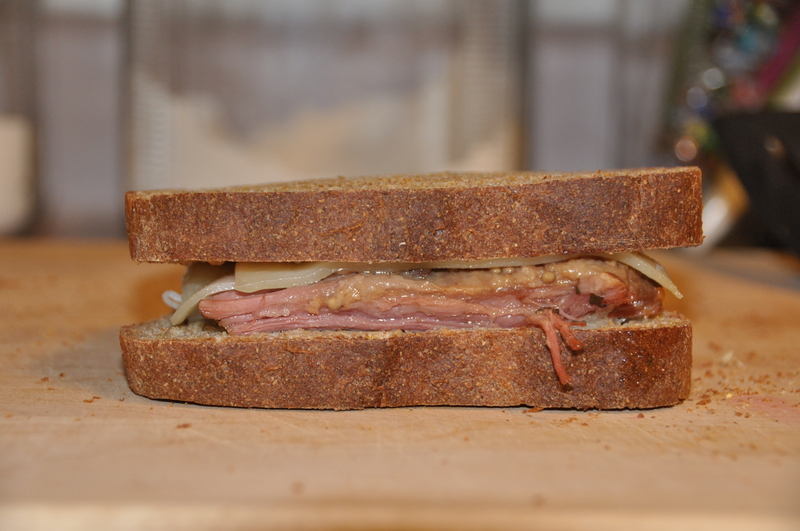 It is clear that his mother was a tremendous influence in his culinary life, and he very much admired her. 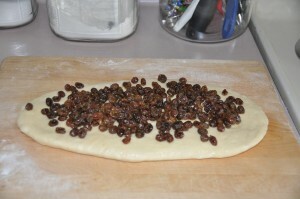 In her honor, I am making this raisin bread recipe as written (for the most part) because I felt it would rather sacrilegious to substitute dried cranberries. 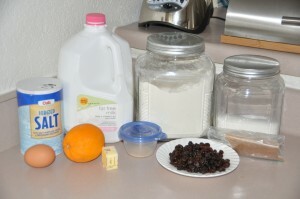 Modifications: I halved the recipe, and I soaked the raisins in water, nutmeg, and orange peel for a few hours instead of in sherry, mace, and orange peel overnight. My dough mixed and kneaded up quite nicely, but the first rising took almost three hours. 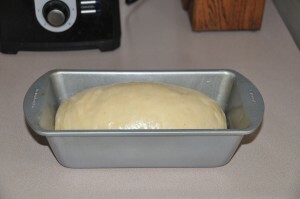 When it had finally doubled in size, I punched it down, kneaded lightly, and let it rise for another 30 minutes. 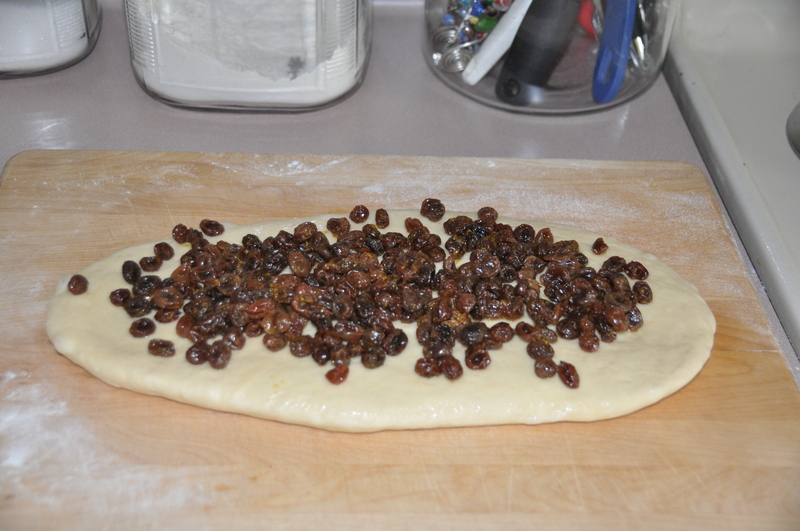 Next, I rolled it into a rectangle and topped it with melted butter and the drained raisins. 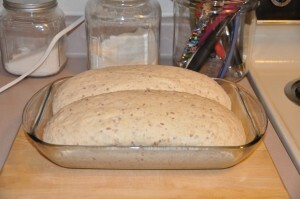 I rolled the dough up from the short side (after doing it backwards on my first attempt, ending up with a very long loaf that didn’t hold together) and placed it in my 8 x 4 loaf pan for another half hour of rising. I baked the loaf at 400 degrees for 10 minutes, then at 350 degrees for 20 minutes. The verdict? For a bread that involves raisins, this one isn’t bad. 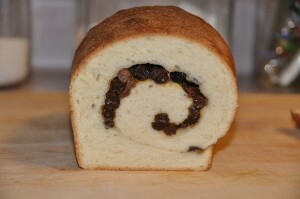 It has a buttery, fluffy texture, and the hint of orange from the prepared raisins is a nice touch. 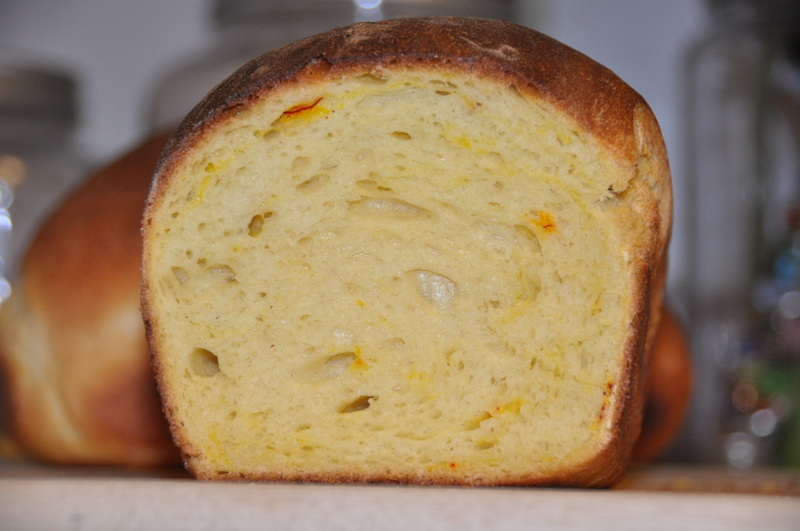 If you must make raisin bread, Mother’s Raisin Bread is a good one. Me: In a good way? Mike: If you like the taste of potpourri. Yesterday Mike and I closed on our first house. How did I celebrate? 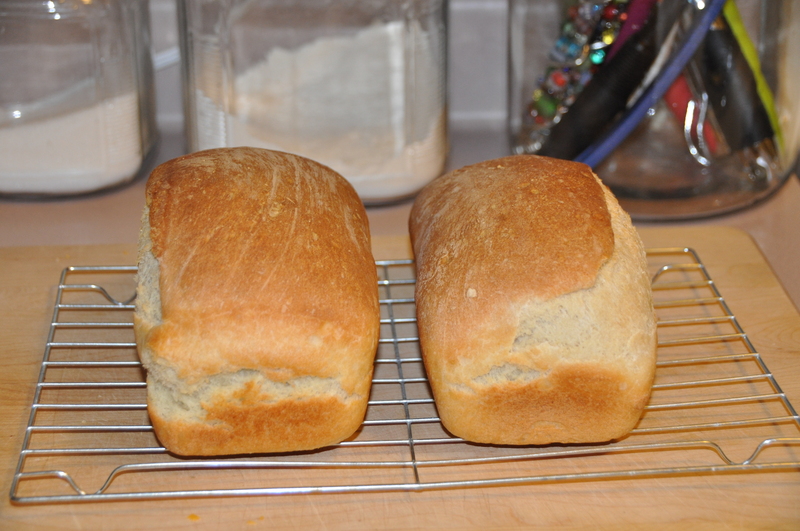 By baking bread (there was also a bottle of champagne). 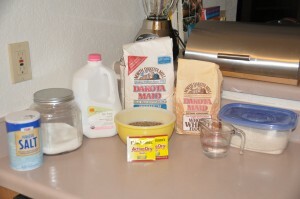 I started by mixing the milk, two cups of flour, and the yeast together to form a sponge. 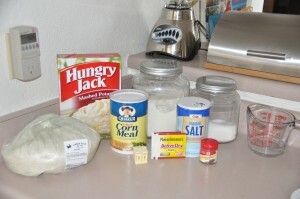 I let that rise for 45 minutes, and then added the rest of ingredients. 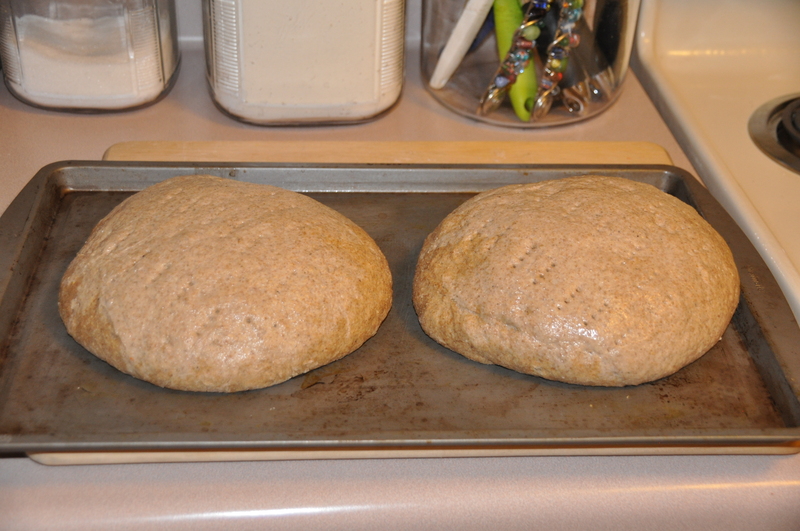 It took an extra half cup of flour to form a firm enough dough, which I let rise for an hour. 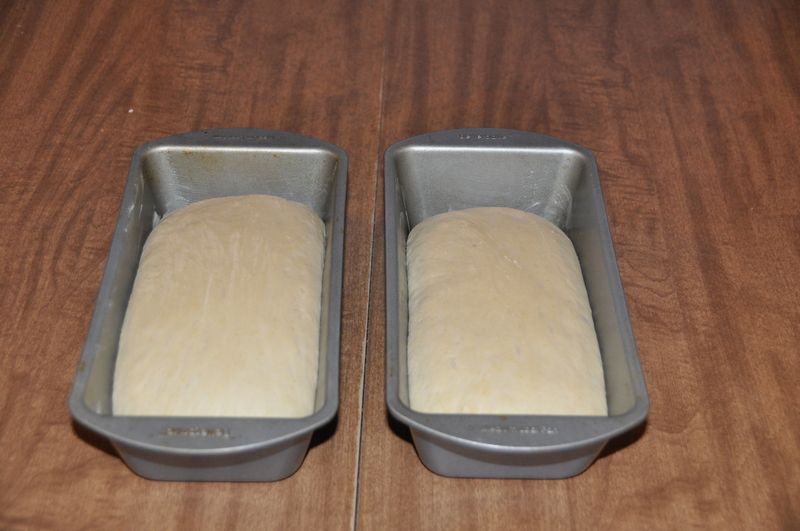 Then, I lightly kneaded the dough with some more flour and formed two loaves. After yet another hour of rising, the loaves were ready for the oven. 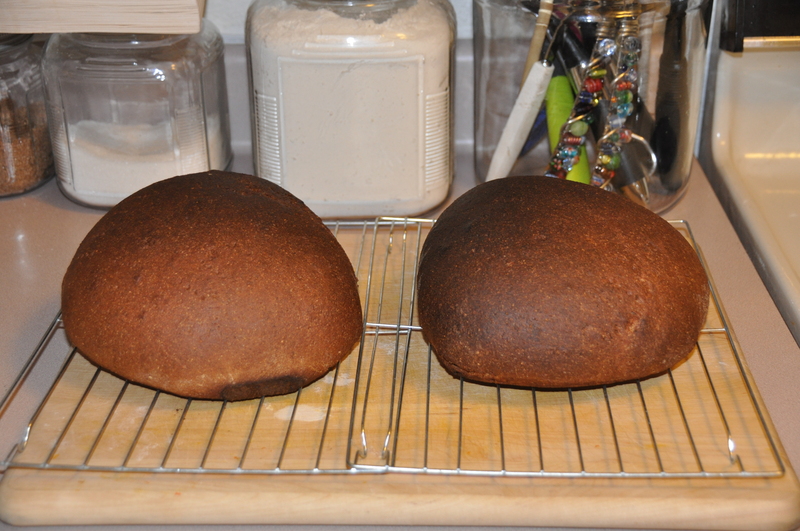 I baked the loaves at 375 degrees for 45 minutes. I would characterize Vertekake as one of the few recipes that I have taken an active dislike to, solely because the mixture of cloves and pepper actually does taste like potpourri. I don’t like potpourri as a scented decorative element, so I definitely don’t want to eat it. 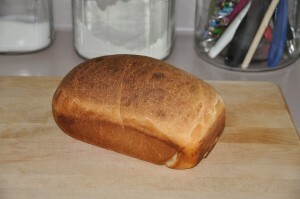 This is not a bread that I would recommend, to put it mildly.